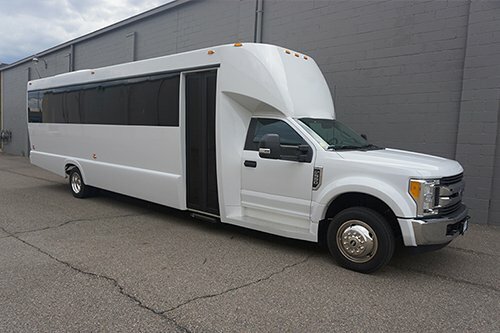 This is our 30 passenger white party bus with black accent around the windows. The windows are also tinted for your privacy while you're on the vehicle. 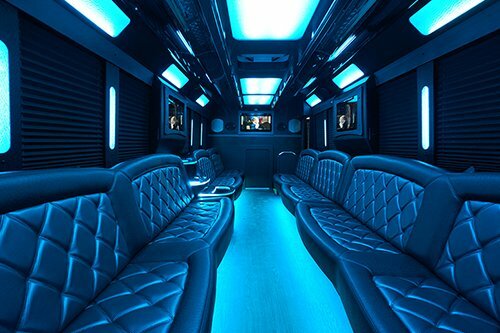 The bus has a limo style interior with customized leather seating around the outside of the vehicle so the passengers are facing each other instead of shuttle style seating where everyone is facing forward. 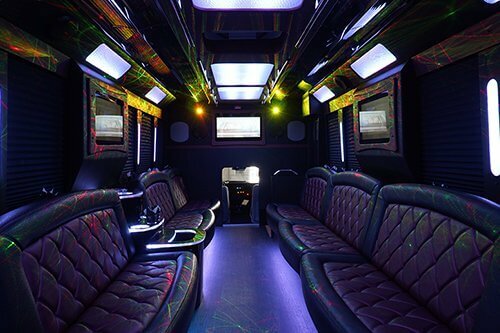 The 30 passenger limo bus has a custom light controller hooked up to RGB lights that you can program different light shows. The controller has a variety of options for which pattern the lights change color in. The lights are locate on the steps, ceiling, walls, and kick panels in the bus. It has a loud sound system which includes subwoofers with their own amplifiers. For your music there is a CD player which also has an MP3 player connector which is a headphone jack that will plug into almost anything. It also has AM/FM. The vehicle has four flat screen TV's with their own DVD player to watch anything you would like. The bus also has hardwood flooring and a stripper pole. If you would like to bring your own drinks there are two custom granite bar tops with built in coolers which will be full of ice and there will also be cups and paper towels provided.